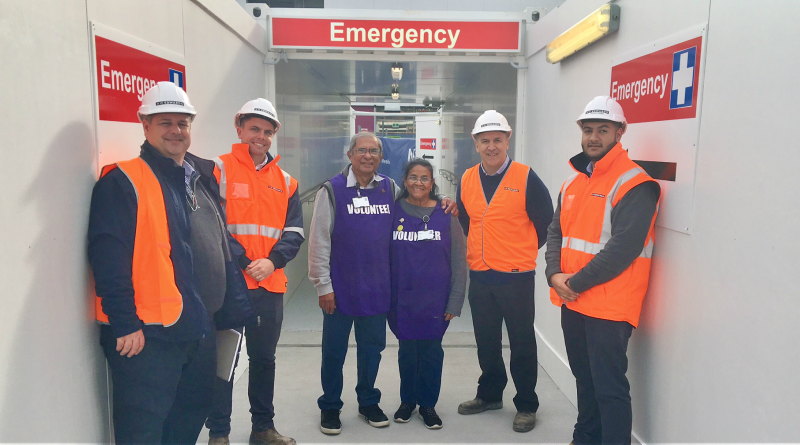 Our AW Edwards construction team; AW Edwards with wayfinding volunteers Daphne and Brian at the new Emergency Department pedestrian link bridge. Things are looking a little different at Blacktown Hospital today as new pedestrian entries open for the emergency department and the main hospital. A new pedestrian bridge will connect the main entry drop-off area to the Emergency Department, and the existing main entry has been replaced with a temporary entry behind Gloria Jeans café. BMDH Project Manager Robyn Campbell said the change allows us to maintain access into the hospital and university while the new acute services building is constructed. “To create the new hospital building we need to extend Hospital Street and break through the exiting main entry, without affecting access to the hospital,” Robyn said. Further changes are on the way with a new entry road scheduled to open later in the year. “It’s a very exciting time because people will really start to see the changes, but it’s very important to stay safe – drive slowly, walk only the marked paths, and follow signs and directions from site staff,” Robyn said.